I noticed that most of my thoughts revolve purely on what's next or what was. I wake up and start mentally breaking down my day; I go to work and think about what I can do or where I can go during lunch; during lunch, I think about my afternoon at work; at work again, I think about what I can cook that evening; cooking, I think about what I can watch on TV later; watching TV, I think about what I can do that would be better than TV (write a grocery list? make a list of must-have songs for the wedding? make a list of people I would like to invite for supper?) or if I could have done or said something differently during the day; right this moment, while blogging, I thought about who I could call to say hello to (I just took a break to call someone). Even on weekends, as soon as my eyes are open, I am on my feet and many things are on my mind. What can I do? What can I cook? What can I buy? Who can I see? Who can I call? At night, when I put my head on my pillow, my mind is rarely at rest but is instead retracing the steps of the day or is thinking about the future. Am I on the right path? What can I do to improve myself? Have I accomplished enough? What can I do to earn more money? What can I do to reach the next level? I live in the past, in the future, in an illusion...and it's exhausting. We live in a society that praises productivity, ambition and goals for all the wrong reasons. Of course, I am not saying that wandering aimlessly through life without goals and ambition is a good thing. I am saying that we are brainwashed to believe that ambition is the chase of money, status, power, fame, etc. Ambition should first and foremost be the chase of happy experiences and happy "nows". We are kicking our goals further and further and trying to put our "happy-nows" on standby for "happy-tomorrows". We can all make more money and have more power and more fame so how do you know when/if you have reached your goal? How do you know when it's time to open your bottle of "standby-happy-nows"? Let me tell you something: you can never open your bottle of "standby-happy-nows"; in fact, there is no bottle. 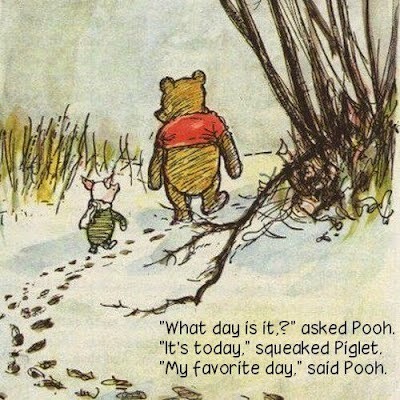 All you have is your "now" that you choose to make happy or unhappy; or you have the illusion of "happy-tomorrows". Once again, I'll mention that I am not promoting a life without goals, without ambition, without motivation and without dreams. Like many of you out there, I want to improve, I want to be healthier, I want to learn more, I want to reach the next level in my career (a few extra bucks would not hurt! ), etc. However, many of us have put the happiness of our "nows" too far down on our priority lists. Everybody, wake up from your illusion and stay ambitious about being happy and enjoying life. Appreciate all that you have and all that you have accomplished and live your life happily in your "now", not in some "maybe-happy-tomorrow"! One food that ALWAYS made me happy as a child (and still does as an adult!) 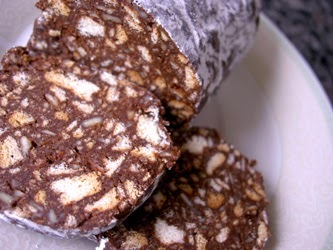 is Chocolate Salami! Here's the quick and oh-so-simple recipe. 1- Coarsely crush the cookies. 2- Whisk the egg yolks with the sugar. 3- In a big bowl, melt the butter (in microwave or bain-marie). 4- To this bowl, add the cocoa, sugar-egg yolk mixture and vanilla (or liqueur). Mix together, Add crushed cookies and mix until combined. 6- Lay out a piece of plastic wrap big enough to hold the mixture. Transfer the slightly firm/chilled mixture to the plastic wrap and shape into a log. 7- Wrap the salami log by folding the plastic wrap upon itself, twist the sides, wrap this in aluminum foil or grease paper and refrigerate overnight (or about 6-8 hours).